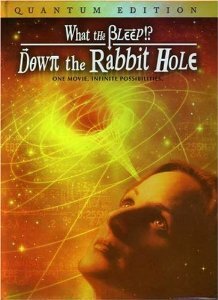 What the bleep do we know about how new age literature cherry-picks its science? Science is prestige. Many new religious groups know this very well, and desire to have their spiritual claims vindication by Science. This is especially the case for esoteric new religions, which often owe their theological foundations to Theosophy and other 19th century occultist discourses that placed much emphasis on the need for a unification of science with “perennial wisdom”. Viewing the use of science in modern esotericism and new religious movements in the context of attempts to gain legitimacy and cultural capital has obvious merits. There is now quite a bit of scholarship out there demonstrating the usefulness of such an approach (see my review in Asprem, 2015a). But it also leaves some important questions unanswered. Science is vastly productive: with the massive production of scientific studies each year, why is it that occultists, new agers, or alternative spiritual-but-not-religious types choose the particular scientific themes that they do, rather than other ones? It may simply seem “obvious” that a new age science book is more likely to deal with quantum entanglement than the recent advances in inferential statistics. But why is that really so? It may also seem obvious that the new age account of quantum entanglement should differ in crucial ways from the account most physicists would give. But in what way do they tend to differ, and why? These sorts of questions have not really been addressed before – hence, most of what we know about the use of science in contemporary religious settings either concerns the discursive functions of science, its place in the metaphysical system in question, or (to some extent) the historical background. Put differently, we know that new agers cherry-pick their science, even what they pick, but not really how they do it or why they do it that way and not some other way. In an article that was recently accepted for publication in Method & Theory in the Study of Religion, I argue that the cognitive science of religion (CSR) has some very useful tools that allow us to take a fresh look at the spread of scientific references in religious contexts. One of the core pillars of CSR has been to advance explanatory models of how certain kinds of representations get formulated, shaped, spread, and transformed – that is, what Dan Sperber (1996) has called an “epidemiology of representations”. For the most part, such studies have focused on (prototypically) “religious” representations like “gods” and “supernatural agents”, trying to explain the remarkable similarities of core features of such representations across cultures. However, an epidemiological approach can also be very helpful for understanding how “scientific” representations spread as well. And not only in religious or esoteric contexts, but throughout the broader culture. If this sounds interesting, you are invited to have a look at the postprint of the article itself. To give the gist of it, however, let me show you the key figure and explain the basic point. 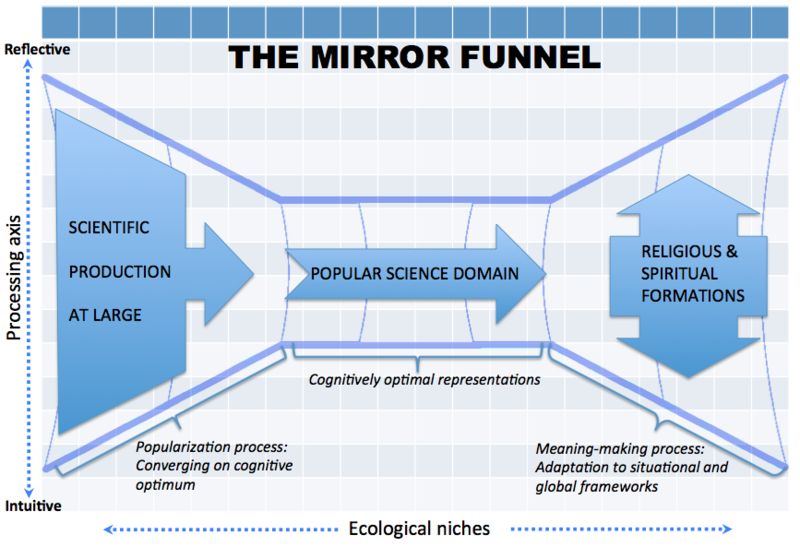 The Mirror Funnel model of transmission of science-based representations. The basic argument is that we need to conceive of popular science (the magazines, books, TV-shows, websites, etc. dedicated to spreading scientific representations to a broad population) as a driving force in the processes by which scientific representations enter the minds of non-scientists. In other words, the first question to ask is how popular science selects, shapes, and disseminates science. One important part of how it does this is, I argue, by a process of cognitive optimization. It presents scientific representations in ways that make them particularly attention-grabbing and memorable, and it prefers representations from the scientific literature that already have some of these features. In other words, we can hypothesize some interesting connections with what CSR is already discovering for religious representations. Popular science creates minimally counterintuitive (MCI) science-based representations, that share many similarities with concepts that are typical of what scholars call “religions”: concepts that break with intuitions about time and space, agency, mechanical and biological systems, relationship of mind to body, and so forth. Importantly, when so many scientific representations are massively counterintuitive, the mediating role of popular science tends to minimize this to a level that creates very salient representations, often in the shape of a metaphor, an analogy, or a thought experiment (I use “Schrödinger’s cat” as a an illustration). These kinds of representations, then, are likely to be picked up, and leave the reader bemused and curious. If that reader also possesses a store of esoteric background knowledge, they are likely to find ways to reconnect such representations to that broader framework. Doing so may eventually cause the representation to become more counter-intuitive, as it gets hooked up to other metaphysical constructs that may be anything but intuitive. These representations may certainly fill rhetorical functions and be deployed to convince various audiences. But the reason why a certain representation gets chosen has a lot to do with how easily it can be used in “online” thinking. That is, it must be good to think with. This framework has a number of implications that allow us to hypothesize about the relations between scientific professional literature, popular science, and science-based representations in religious and esoteric literature. It may even add something to the debate surrounding impact factors and likelihood of a study being referenced (do high-impact journals publish more MCI-clad science?). I discuss some of these at the end of the article. To test them in any rigorous fashion, however, will require much more preliminary work on how to code and quantify science-based representations. That is work I am not doing here, but hopefully the article can at least contribute to putting an interesting set of problems on the table. Research on cultural transfers between science and religion has not paid enough attention to popular science. This article develops models that grasp the complexities of the epidemiology of science-based representations in non-scientific contexts by combining tools from the cognitive science of religion, the history, sociology, and philosophy of science, and the study of new religious movements. The popularization of science is conceptualized as a process of cognitive optimization, which starts with the communication efforts of scientists in science-internal forums and accelerates in popular science. The popularization process narrows the range of scientific representations that reach the public domain in structured ways: it attracts minimally counterintuitive representations, minimizes the massively counterintuitive, and re-represents (or translates) hard-to-process concepts in inferentially rich metaphors. This filtered sample trigger new processes of meaning-making as they are picked up and re-embedded in new cultural contexts. Asprem, E. (In press). “How Schrödinger’s Cat Became a Zombie: On the Epidemiology of Science-Based Representations in Popular and Religious Contexts.” Method & Theory in the Study of Religion. This entry was posted in Articles, New Research and tagged cognitive optimum, contemporary esotericism, epidemiology of representations, Method & Theory in the Study of Religion, minimal counterintuitiveness (MCI), new age science, popular science, popularization of science, quantum mysticism, Schrödinger's cat, science and religion, science-based representations. Bookmark the permalink.